DavidNews HYIP blog - News & Reviews: Eco Tobacco Limited – What’s inside the tobacco field? Eco Tobacco Limited – What’s inside the tobacco field? Another day in the HYIP world and another program to review on DavidNews.com. Today I’m reviewing a program, which has chosen a unique example of HYIP branding. I have been here a while and can’t remember tobacco. However, today I am looking at a program called Eco Tobacco Limited, which joined Golden Stage listing on the DavidNews 6 days ago. In total, the program has been up and running already for 17 days. As usually, I have reinvested in the program some money - $400, to keep you up to date on its performance. So, let’s go, we have tobacco fields to explore! In the last review, I mentioned that most of the websites are built using Gold Coders script, but now I can say that we have the second HYIP built on the H-Script in the row. What a coincidence? If you are wondering what’s H-Script, you can read the previous review. The website looks attractive to an eye and has all standard content pages on it. I would even say that the admin has chosen the middle way by providing the most relevant information without overloading it too much. I almost hit the enter button to move on to the next topic, but then I noticed something I dislike about the websites in general – it’s not mobile friendly. Yes, it’s very important for me and many other smartphone users. Of course, it will not stop from opening the Eco Tobacco Limited website on mobile devices, but it will be a nightmare. 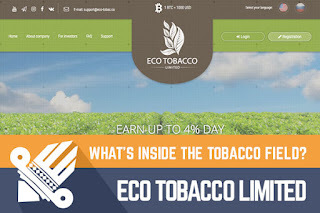 Eco Tobacco Limited on the company biography page claims that twenty years ago they started their business as a small, high-quality tobacco factory. I’m totally fine with the fact if a tobacco company decides to build a HYIP, but it looks funny if a company claims how it has developed a business in 20 years and on the same page there is company registration certificate issued by Companies House on 28th of March 2017. However, from this fact, you can learn that the admin has done homework and registered the company in the UK. I understand that most of the stories written by admins are just another form of creative writing, but they must make sense! Eco Tobacco Limited has chosen social media as a channel for publishing their announcements. In fact, the admin has been very active sine the 2nd of April on the Facebook group page. The latest entry on the page is about video review competition. Unfortunately, I’m not doing video reviews and can’t participate… Moreover, there has been very active communication on social media for Russian-speaking audience on Vkontakte with more than 200 members in the group. Finally, the admin has chosen to communicate also in the Instagram. In fact, I can’t remember a HYIP communicating on the Instagram lately. Notably, they have 105 followers there. In the meanwhile, you can communicate with the program representatives through e-mail and online chat. Comparing to many other programs, this chat seems to be an online chat with someone talking to you in the real time. If you have tried to reach the Eco Tobacco Limited and have some experience to share, please use the chat box on the right sidebar! For most of you, the most important part of the review is the investment plans. Eco Tobacco Limited has three investment plans, but there are two more with signs - Coming Soon. Unfortunately, there is no information about them. Therefore, I will stick to the current plans. The program accepts investments starting as low as $10 in the first two investment plans and starting $200 in the third investment plan. Keep in mind that deposit is returned at the end only in two plans Seedling and Virginia, but kept in Maryland. The most important thing for me and you is to calculate the daily profit of this program. In fact, the admin has thought about us and integrated a calculator where you can see a daily profit of planned investment in each of the investment plans. For example, $200 investment in the 3rd plan called Virginia with 4% a day would reach a break-even point in 20 days. At the end of the investment cycle after 31 days there would be a profit of $48. Unfortunately, there another 16 days to go until the end of the first cycle of the plan Virginia. In case you have made a deposit and notice anything worth sharing, please use a chat box on our website and spread the word! We have probably gone too far in the tobacco field and it’s time to get out of it. To summarize, I like the website, the amount of content and structure as well. Unfortunately, the lack of mobile responsive version gives a bitter aftertaste. Most likely another HYIP with roots in Russia – use of H-Script, Russian language option and active communication on the social media for Russian-speaking audience. The admin didn’t sell me well this time the tobacco story, but it doesn’t matter since all HYIP stories are most likely just pieces of creative writing. In terms of investment plans no surprises, because lately there have been many programs offering 2-5% a day and this was not exception. From the website, it’s hard to predict when the storm will begin over the tobacco field. It’s not there yet and hard to predict when it’s coming. I’m here to gather facts and details, to save your time and not to recommend anything. As usually, remember that all HYIP’s are highly risky and you are the only person responsible for your investments. Therefore, if you ever decide to make any investments, don’t invest more than you can afford to lose! Investment plans: 0.9% daily for 31 calendar days, initial deposit returned at the end of the investment term. 2% up to 4% daily variable interest rate for 52 days, initial deposit included in the payments (up to 155% profit). Join Eco Tobacco Limited Here! Did you ever try to automate your free satoshi claims with a BITCOIN FAUCET ROTATOR? YoBit lets you to claim FREE COINS from over 100 distinct crypto-currencies, you complete a captcha once and claim as many as coins you want from the available offers.